Thirteen percent of all U.S babies are born before 37 weeks. - Adjusted Age: Premature infants have two ages: their chronological age, based on the day they were born; and their adjusted age, based on their due date. Your pediatrician will use the baby's adjusted age when evaluating her growth until age 2 or 3, when preemies generally catch up to their peers. 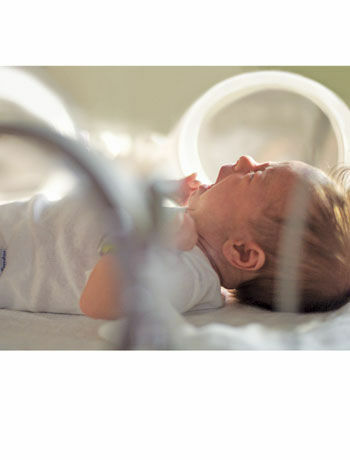 - Milestones: Premature babies typically sit up, crawl and reach other early milestones at a slower pace. Talk to your pediatrician about your baby's progress and attend follow-up clinics offered by many neonatal intensive care units (NICUs). - Breastfeeding Ability: Breast milk is especially beneficial for premature infants, and in the beginning your baby might receive your pumped milk via a feeding tube in the NICU. Once she's home, your baby's sucking ability may still not be at 100 percent. If you're having difficulty, experiment with different positions or consult with a lactation consultant who has experience with preemies. Life in the NICU Many premature infants spend weeks or months in the neonatal intensive care unit (NICU), surrounded by medical staff and equipment. Don't be intimidated—your presence is still essential, says Peggy Gordin, M.S., R.N.C., president of the National Association of Neonatal Nurses. "Parents have more time and just the right touch," she says. Even little things like diapering and bathing your baby will bring you closer. Plus, hearing your voice will help her adjust to life outside the womb. - Take her to get an injection of Synagis, a medication that helps prevent serious RSV complications, once a month throughout RSV season, usually fall through spring. - Have people wash up before holding your baby. - Avoid anyone who has a cold, fever or the flu. - Don't take your baby to crowded places.